Five prospects, one dream. “Under Armour Presents Prime U” debuts at 8 p.m. Five prospects, one dream. On Wednesday at 9:00 p.m. ET, Under Armour Presents Prime U debuts on NFL Network, chronicling the journey of NFL hopefuls training under the tutelage of NFL Network analyst and eight-time Pro Bowler Deion Sanders. Produced by NFL Films, the 60-minute Under Armour Presents Prime U goes inside Sanders’ training camp in Irving, TX for a look at how the legendary cornerback imparts his knowledge of the game and life as a professional football player to the next generation. "Prime U isn't the normal training process that you get from a standard training facility," said Sanders. "It's not just about training physically, but also developing a healthy spiritual and psychological makeup. From family to finances, Prime U works to ensure that these young men have all the tools in place for a successful life and career in the NFL and beyond." When does he teach the guys to paint their QB as a racist like he did with Aikman??? 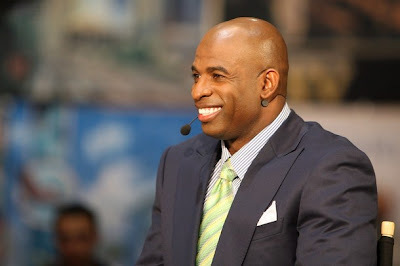 And while Deion teaches the prospects football, the prospects will in turn teach Deion Sanders English. I just want to know when he is going to make a music video with them.